Every Iglu-Dorf hotel is carved out of snow. Which means every one is built from scratch each year. And we aren’t talking about snow huts of the sort you could concoct in your back yard. Iglu-Dorf properties aren’t even of what you might think of when you imagine Eskimo accommodations. 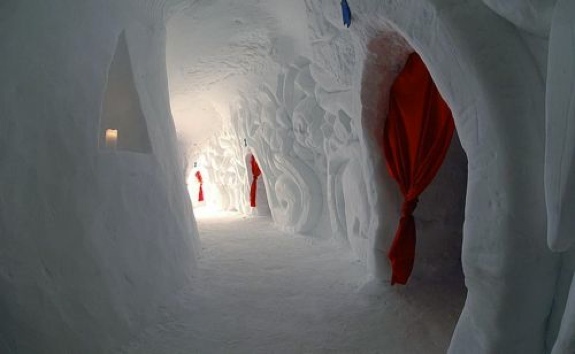 Instead, an Iglu-Dorf hotel is a snow compound complete with check-in desk, bar, restaurant and whirlpool/spa area, all connected via underground (or, rather, under-snow) hallways. So, you might be asking, is staying at in igloo hotel an unbearably cold experience? Yes and no. No, it isn’t (necessarily) unbearable. Yes, it is (at least in part) cold. Temperatures inside the tend to stay around -3°C (27°F) with no wind chill. That means you’ll be wearing a coat, and probably a hat and gloves, when at the bar and in your igloo room. And going to the restroom is an undeniably chilly affair. But the beds are warm—each features a high-end sleeping bag and/or a pile of sheepskin blankets. Meals tend to be warming too—think stews and fondue. Upon request, the staff will bring hot tea or coffee to you in your bed in the morning. And what better excuse than the cold to consume lots of schnapps in the evening? Another great feature of staying at an Iglu-Dorf hotel: the communal atmosphere. The bar often hosts movies nights and other social events. During the day guests can opt to participate in staff-organized snowshoe tours, sledding matches and skiing expeditions. 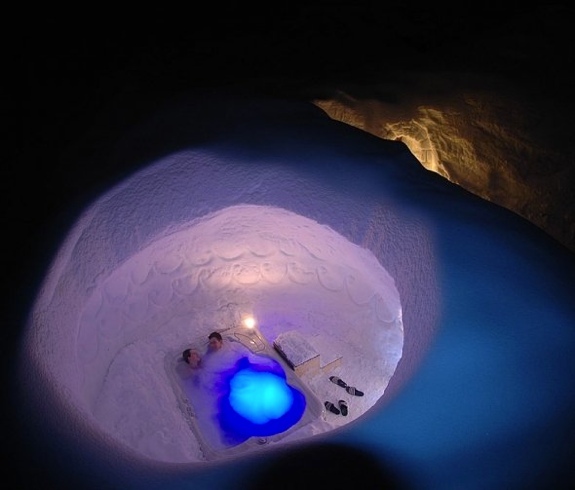 Most Iglu-Dorf locations have four categories of igloo rooms to choose between: standard, romantic, family and “hot.” Some of the romantic igloos have private hot tubs. The family igloos are good for groups of friends, too. As for the “hot” rooms, they are like luxury tents with heaters and normal hotel room furnishings; these rooms are aimed for people who want some of the igloo hotel experience but are worried about being perpetually cold. 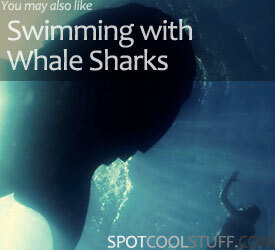 Spot Cool Stuff understands this concern. 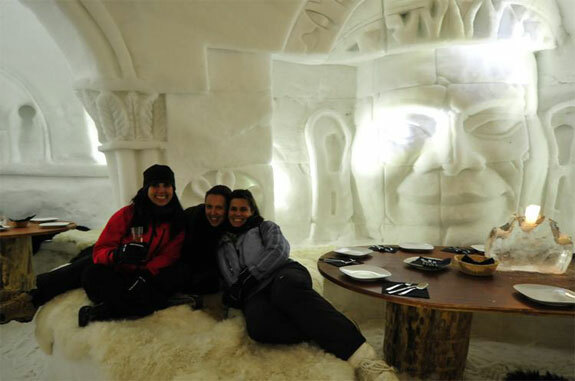 But, really, how can you stay in an igloo hotel and not sleep in a snow igloo? Davos, Switzerland – Romantic igloos and what’s probably the world’s coolest whirlpool (see top pic) located above 2600 meters of altitude. Note that “hot” igloos are not offered at this location. 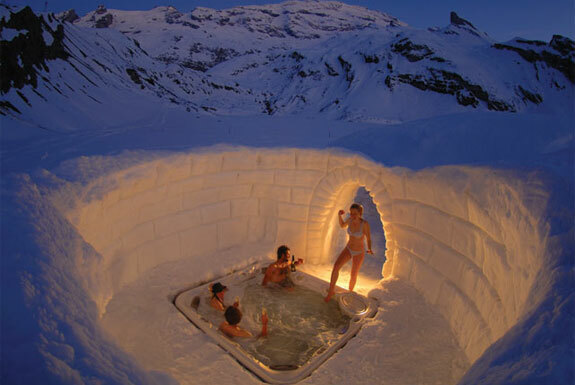 Engelberg-Titlis, Switzerland – Inside some of the igloo rooms here are works of art hand created by Inuit Eskimos. Gstaad, Switzerland – Located in south western Switzerland at around 1550m of altitude, Gstaads is the lowest elevation to host an Iglu-Dorf resort. The igloo suite here encompasses a private whirlpool and is amazing. Zermatt, Switzerland – Excellent views of the Matterhorn; located near a boutique hiking hut we previously reported on. Zugspitze, Germany – The highest igloo hotel in the world; there are views of four countries from here. 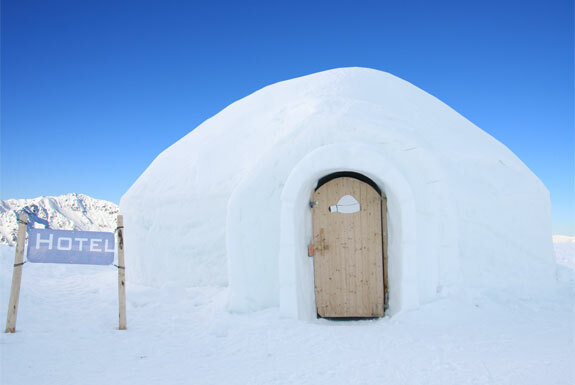 St. Moritz, Switzerland – The ritzy resort of St. Moritz is one of the least likely places to host an igloo hotel. Yet here one is. There’s a great communal Jacuzzi but no igloos in the “romantic” category. Andorra – Most people don’t know that it’s possible to have breakfast on the coast of Spain and then have lunch in an igloo in the same day. But then the tiny country of Andorra isn’t one most people know about in general. For more visuals, check out the photos and video below. 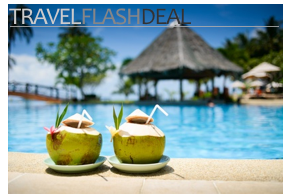 Iglu-Dorf hotels are generally open from Christmas until around mid-April. Bring your sense of adventure. And a good pair of socks. That is really fascinating! I want to go to the one of the Iglu Dorfs in Switzerland. Though a huge fan of the inflatable bubbles, I’m not sure they provide a more remarkable experience. The igloo rooms are pretty amazing. But, yes, they are cold.